The genus Episcia belongs to the New World Gesneriaceae. Episcias have a stoloniferous habit. Rapidly growing stems are produced, along which and at the tip are plantlets. These plantlets root readily, and in nature can result in a large mat of plants, each of which may have originated from a single plant. 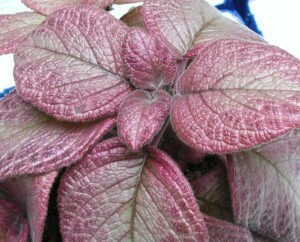 Episcias are most often grown for their highly attractive, variably coloured foliage. Many hybrids have been created, with foliage ranging from pale pink, white and green, to dark chocolate brown, with many variations of silver, red and pink in between. Some have attractive veining. Flowers are usually bright reddish orange, although some species and cultivars have lavender or pink flowers. Episcias require warmth and humidity to do well. They do not tolerate cool temperatures or dry conditions, and must be kept moist. Some cultivars require a protected growing environment, although many growers do well with most cultivars in windows or on open shelves under lights. Episcias are primarily terrestrial in nature, where they function as ground covers in tropical rainforests. They seem to perform best in a medium that is both reasonably well-drained, and somewhat moisture retentive. Many growers report good success using standard African Violet soil mixes.